Since time immemorial we have been fascinated by the power of invisibility. Plato used the “Ring of Gyges” to wrestle with the ethical and moral dilemmas it poses. Just think of H.G. Wells’ “Invisible Man”, Tolkien’s One-Ring, or Harry Potter’s Cloak of Invisibility. Does invisibility free us from moral obligations, and if we possessed this power would we become corrupted or would we enjoy secretly righting wrongs? Outside the realms of science fiction, “invisibility” is often an every-day problem for our fellow citizens. I am thinking of those whose problems just don’t make the 24/7 news cycle: the homeless woman sleeping in a shop doorway, the ex-offender walking through the prison gate with nowhere to go, the young man who has dropped out of school with no grades. Often we simply ignore those populations, or – to borrow from Harry Potter – throw the “cloak of invisibility” around them. To be out of sight is often to be out of mind. The ‘invisibility’ of those with developmental disabilities was thrown into sharp relief during my recent visit to the U.S. Virgin Islands. 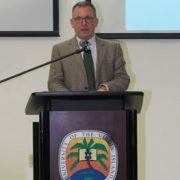 I was invited by the VI Developmental Disabilities Council to present on ‘Data Driven Policy Development’. My audience was policy makers, including those standing for elected office. If I had any doubts about the relevance of my presentation, the audience quickly rose to the occasion. “How could the needs of those with disabilities be met in the absence of data?”, they demanded. Without data, this population was “invisible”, their needs unknown to those in charge of policy. Without data, those who advocated for better services were hampered in their arguments. Without data, practitioners lacked the evidence to seek funding for new services. The US Virgin Islands are still recovering from the two hurricanes that devasted the territory last year. As they rebuild the fabric of their communities, it was clear to me that data were not a luxury or a ‘nice-to-have”. Rather, my audience recognized the value of data in throwing light on a population that had often been marginalized prior to the hurricanes, and whose needs had since become more acute. While there is much more work to be done in defining data and setting up systems to collect and analyze data, I suggest that their demand for data was a good one and a great call to action. The collection and analysis of data must never be allowed to fall by the wayside – it’s a founding stone, not a ‘nice to have’. Of course, I would say that, wouldn’t I? But here are six concrete reasons why data is important, drawing on Get the Data’s recent work with the Advice Services Alliance (ASA) as a case study. There is no more powerful tool for influencing stakeholders than data, as I explained in more detail in this recent blog post on using data to influence stakeholders. ASA works with its members – various associations who provide advice services – to capture and analyse data from the front-line. This gives weight to conversations with all of those who have an interest in ASA’s direction of travel, reassuring them that strategic decisions are being made in response to changing needs, and reinforcing the professionalism that underlies the work they and their partners do. In particular, data is invaluable in drawing in new sources of funding, and persuading potential funding providers. Faced with a choice of projects or programmes in which they might invest, with ever-tighter budgets, funding bodies will regard convincing data as a good reason to choose your work over others. 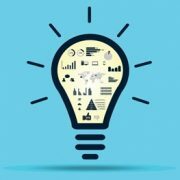 ASA will use data to add weight to its funding applications for this reason. ASA seeks to lead thought, representing its members in national discussions by highlighting issues affecting the people who use advice services. The body of data and analysis to which ASA will refer confers authority and allows the organisation to direct the debate and steer collective thinking around youth issues. Using data provided by its members ASA will be able to identify areas for improvement in front line practice and also to pinpoint what is working especially well so that good practice can be shared across the community. It informs training programmes, service improvements and helps determine how resources should be employed for maximum impact. Good data leads to better data. Use of data means we learn its limitations and how to outcome those. We also learn how to measure the right outcomes, better; particularly in how to measure informal outcomes along said formal attainment. Cloud-based databases are cheap and easy to implement compared to the cumbersome systems of the past. They make it easier for people to enter data and share it. So there’s really no excuse for failing to collect and analyse data in this day and age. If you would like to find out more about our cutting-edge approach to data capture and analysis please get in touch. When choosing a database for your project or programme, made to measure software or flashy online tools aren’t necessarily the right choice. If you’re going to gather and analyse data in a serious way of course you need a database of some sort and, having spent much of my academic and professional career buried in them, I’m very much an advocate. But I too often see evidence of the database itself being regarded as the end rather than the means – as the solution to the challenge at hand rather than a tool for addressing it. The problem is that it takes huge amounts of time, resources and testing to create excellent software from scratch or to implement a powerful online tool, meaning that in practice these products all too often become clunky, creaky and frustrating. And products that don’t work well don’t get used. As always, the answer is to focus on what you want to achieve. That will help you understand what kind of data you need to collect, who will be collecting and managing it and, therefore, what kind of system you need to house it. 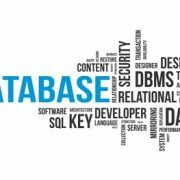 Sometimes, of course, a custom-designed database or powerful online application are absolutely the right choice but, in my view, those occasions are actually very rare. More often than not the humble, rather plain Microsoft Access, or a similar tried and tested generalist professional product, is not only cheaper but also better suited to the task. Remember, these programmes have been worked on over the course of not only years but decades, and have huge amounts of resources behind their development and customer support programmes. Standard software also makes sharing, archiving and moving between systems faster and easier in most cases. It is also possible to customise Access databases to a fairly high degree, either in-house using the software’s in-built features, using third-party software, or by hiring developers to create a bespoke front end interface without getting bogged down in the complicated underlying machinery. And cloud data storage has made all this easier and cheaper than ever. In conclusion, I’d like people to recognise that the real deliverable isn’t necessarily software, and that there’s no shame in off-the-peg. After all, a database is only as good as the information it holds and a clean set of useful, appropriate data is what people should really be proud of. You know you’ve achieved results – the data tells you so – but how do you influence sceptics to believe it? It can be a rude awakening to take the findings of a study outside your own team or organisation, where trust and mutual support are more or less a given. In front of a wider audience of funding providers or other stakeholders, you will inevitably in my experience find yourself being challenged hard. This is as it should be – scrutiny is a key part of a healthy system – but, at the same time, it’s always a shame to see an impactful project or programme struggle purely because its operators fail to sell it effectively. Fortunately, while there are no black-and-white rules, there are some things you can do to improve your chances. When I present findings I do so with a confidence that comes with experience and from really understanding the underlying mechanics. But if you’re not a specialist and don’t have that experience there are things you can do to make yourself feel more confident and thus inspire greater confidence in your audience. First, make sure you have thought through and recorded a data management policy. Are you clear how often data should be entered? If information is missing, what will you do to fill the gaps? What are your processes for cleaning and regularising data? Is there information you don’t need to record? A professional, formalised approach to keeping timely and accurate data sends all the right signals about your competence and the underlying foundations of your work. Secondly, use the data as often as possible, and share the analysis with those who enter your data so that they can understand its purpose, and own it. Demonstrating that your data is valued and has dedicated, accountable managers hugely increases its (and your) credibility. Thirdly, take the initiative in checking the reliability and validity of your own tools. If you use well-being questionnaires, for example, take the time to check whether they are really measuring what you want to measure in most instances. In other words, try to find fault with your own approach before your stakeholders so that when they find a weak point you have an answer ready that not only reassures them but also underlines the objectivity with which you approach your work. Finally, and this might feel counterintuitive, you should identify the weaknesses in your own data and analysis and be honest about them. 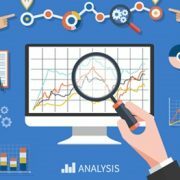 All data and analysis has limitations and being clear about those, and the compromises made to work around them demonstrates objectivity which, again, reinforces credibility. In conclusion, the better you understand your own data and analysis, flaws and all, the more comfortable and confident you will feel when it, in turn, comes under scrutiny. When a potential funder glances at your application for a grant will they see reassuring signs of quality or something that immediately makes them wary? 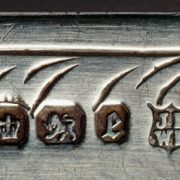 When an antique collector finds what they suspect is a piece of fine English silverware they flip it over and look for a set of hallmarks – simple indicators that certify the metal, identify the maker, the place of production, and the year of manufacture. It can help them distinguish quickly between, say, an item of 17th-century sterling silver produced in London by a famous craftsman, and a mass-produced reproduction with only a thin plating of the real thing. Similarly, it strikes me that there are three hallmarks of a good evaluation plan. First, it should be relevant. Secondly, it ought to promote adaptive change. And, finally, it must be technically competent. Get this right and you will certainly have a funder’s attention. What has got me thinking about all this lately is a presentation I’ll be giving at the National Grant Conference which takes place in Atlanta, Georgia, between 25 and 27 July 2017, sponsored by the American Grant Writers’ Association. My presentation complements the work Get the Data does in the UK where our social impact analytics practice provides organisations, including non-profits with the expertise they need to measure, improve and prove their impact. Our social impact analytics are often used to convince careful funding bodies to fund or invest in programs which ultimately assist the most vulnerable in society. So, going back to the first of those hallmarks mentioned above – what sells an evaluation plan as relevant? You have to know, first, what your organisation needs and what type of evaluation you are looking to conduct. Practitioners, board members and those responsible for awarding funding all think constantly about what impact they are seeking to achieve, how to measure it, and how they can achieve it with the resources at their disposal. You need to convey to them that you understand their priorities and mission and tie your work into theirs. Of course, that’s easier said than done: stakeholders very often value different impact information so there is rarely a one-size-fits-all solution. This is an area where Get the Data can help. Our impact management services can assist in defining the needs of an organisation, and through smart reporting and analysis systems will ensure individual stakeholders can find the information that matters to them. In the next post in this series, I will consider how we can help deliver an evaluation plan that promotes adaptive change and is technically competent. 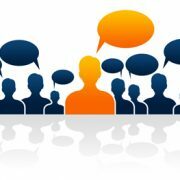 In the meantime, I look forward to hearing from you if you would like to learn more about how our social impact analytics can support your application for grant funding email me to get the conversation started. Please also visit our website where you can sign up for a free one-hour Strategic Impact Assessment in which we’ll take the time to evaluate your current impact management success and will identify key areas to develop in order to help your organisation maximise your social impact. Wouldn’t it be great if there was a way of measuring your social impact across multiple projects using a single dependable statistic? Well, I’ve got some bad news, and some good. I was recently talking to a charity who wanted to know how if they could go about measuring and reporting the overall impact of the organisation on children and families. With multiple strands each aiming to achieve different things, they asked if a single outcome measure – one accurate, reliable number – to sum up the impact of the whole organisation was either possible or desirable. First, here’s the bad news: it’s very unlikely – I might even be so bold as to say impossible – that any such thing exists. You might think you’ve found one that works but when you put in front of a critic (or a nitpicking critical friend, like me) it will probably get ripped apart in seconds. Of course, if there is a measure that works across multiple projects, even if not all of them, you should use it, but don’t be tempted to shoehorn other projects into that same framework. It’s true that measuring impact requires compromise but an arbitrary measure, or one that doesn’t stand up to scrutiny, is the wrong compromise to make. There is, however, a compromise that can work, and that is having the confidence to aggregate upwards knowing your project level data are sound. You might say, for example, that together your projects improved outcomes for 10,000 families, and then give a single example from an individual project that improved service access or well-being to support the claim. In most situations that will be more meaningful than any contrived, supposedly universal measure of impact. Confidence is the key, though: for this to work you need to find a reliable way of measuring and expressing the success of each individual project, and have ready in reserve information robust enough to hold up to scrutiny. In conclusion, the underlying solution to the challenge of measuring impact, and communicating it, is a foundation of good project level data. That will also make it easier to improve performance and give you more room to manoeuvre. Placing your faith in a single measure, even if you can decide upon one, could leave you vulnerable in a shifting landscape. Have you ever eagerly awaited the results of a project impact study or external evaluation only to be disappointed to be told you had no impact? ‘How can this be?’ you might ask. ‘The users liked it, the staff saw the difference being made, and the funding provider was ecstatic!’ The fact is, if you’re trying to gauge the final success of a project without having analysed your data throughout its life, proving you made a difference is bound to be difficult. Of course we would all like to know before we invest in a project whether it’s going to work. As that’s practically impossible (sorry) the next best thing is to know as soon as we can whether it is on a path to success or, after the fact, whether it has been successful. But even that, in my view, isn’t always quite the right question: more often we should be asking instead what it has achieved, and for whom. In most cases – rugby matches and elections aside – success isn’t binary, it’s complex, but good data analysed intelligently can reduce the noise and help to make sense of what is really going on. A service might in practice work brilliantly for one cohort but have negligible impact on another, skewing anecdotal results. Changes might, for example, boost achievement among girls but do next to nothing for boys, leading to the erroneous conclusion that it has failed outright. Or perhaps across the entire group, attainment is stubbornly unmoving but attendance is improving – a significant success, just not the one anyone expected. Dispassionate, unprejudiced data can reveal that your project is achieving more than you’d hoped for. Equally, if the goalposts are set in concrete, consistently mining that data can give you the insight you need to learn, improve and change tack to achieve the impact you want while the project is underway. Or, at least, to check that you’re collecting and reviewing the right data – if the answer to any of your questions is a baffled shrug or an anecdote (and it too often is, in my experience) then you have a problem. I’ll be circling back for a detailed look at some of the case studies hinted at above, as well as several others covering various fields, in later posts in this series. In the meantime, consider the project that keeps you awake at night – where are its dark corners, and what good news might be lurking there? 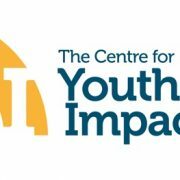 We’re pleased to announce that Jack will be hosting a workshop at The Centre for Youth Impact’s ‘The Measure and the Treasure: Evaluation in personal and social development’ conference on 16th March. The Centre for Youth Impact is hosting the day-long conference to focus on issues of measurement and personal and social development. “The day will explore policy, practical and philosophical debates about whether, why and how we should seek to measure the development of social and emotional skills (or non-cognitive skills, soft skills and character, amongst other terms) in young people. We are planning a thought-provoking and engaging day that introduces participants to a range of ideas and activities, and are particularly keen to draw in thinking from outside the ‘traditional’ youth sector. CRC Reoffending Rates: Who’s Striving, Who’s Struggling? CRC Reoffending Rates: Who’s striving, who’s struggling? Or should we all move to the North West? Last week the MoJ released the interim Community Rehabilitation Companies (CRCs) proven reoffending rates for cohorts that started orders or licences between October and December 2015. As it is now 12 months since the first payment by results cohort started, I thought it would be interesting and helpful to review the performance of the CRCs – the final results will be available in October 2017. If you don’t know, the CRCs are privately run probation services set up in 2014 to manage less harmful offenders and to reduce reoffending rates. As such, part of their payment from the Ministry of Justice is based upon how well they reduce reoffending compared to a 2011 baseline. If the reoffending rate increases the CRC’s contract could be terminated. The payment mechanism is complex – see here for the important documents. 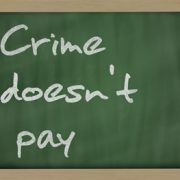 The basics are that if the CRC’s reoffending rate is lower than the 2011 baseline rate, having adjusted any differences in offenders’ likelihood of reoffending, then the CRC will receive a payment. Being just 0.1% lower would not be good enough to trigger a payment – the CRC’s rate must be statistically significantly lower (I have not found in the public domain information on how significant the reduction must be – do contact me if you know of a source). Not enough data have been released to estimate which CRC will receive a payment (the 2011 baseline rates have not been published for example) but there are enough published data to assess the relative performance of each CRC. Each CRC’s published reoffending rate cannot be directly compared because the CRCs’ offenders will present with varying likelihoods of reoffending. Fortunately the OGRS4 expected one year reoffending rates were published. With this information, I estimated what each CRC’s proven reoffending rate would be if likelihood of reoffending was exactly the same in company (the adjusted rate – I used the average OGRS4 rate across all CRCs which was 45.7%). The results are in the chart below. Figure 1: Interim and adjusted reoffending rates in the 21 CRCS (Oct to Dec 2015 Cohort, reoffending rate to December 2016). Source: Interim proven reoffending statistics for the Community Rehabilitation Companies and National Probation Service supporting tables January 2017. See table for bases. There is a large 17.2% spread in interim proven reoffending rate in the MoJ data. This is reduced to a 9.5% spread in the adjusted reoffending rate. The lowest adjusted rate is in Merseyside (34.4%) and the highest is in Warwickshire & West Mercia (43.9%). There appears to be regional clustering at the top and bottom of the chart. 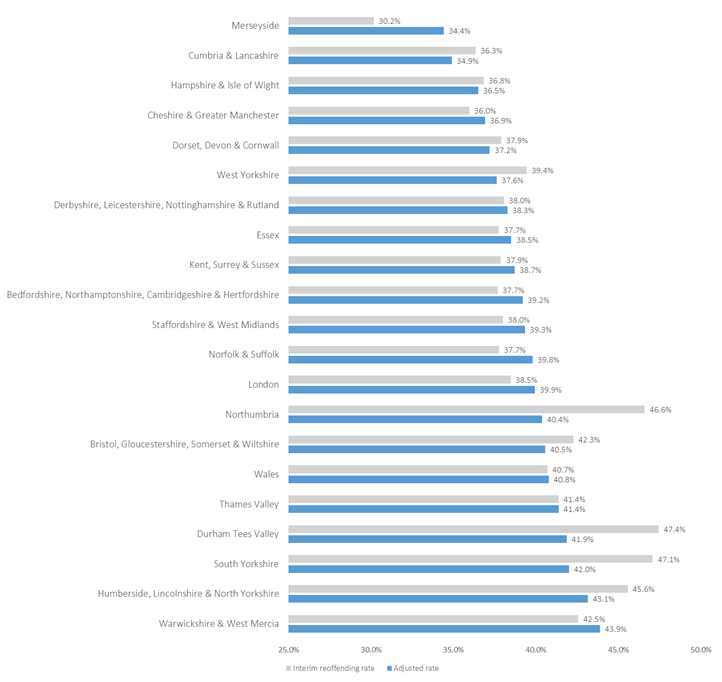 Three of the four CRCs with the lowest adjusted rates are in the North West – Merseyside, Cumbria and Lancashire and Cheshire & Greater Manchester – and the neighbouring areas South Yorkshire, Humberside, Lincolnshire & North Yorkshire, and Durham Tees Valley make up three of the four areas with the highest adjusted rates. This clustering could be due to police practice, the CRCs’ effective work, efficient court processes or in or an unknown factor altogether. These results do not mean the providers in the North West can expect a payment to come their way. We do not know the baseline to which they will be compared and there is another 6 months of convictions data to be included (the proven reoffending measure includes offences within 12 months that are convicted within 18 months). Also there is likely to be an area effect that is not included in the OGRS4 measure but will be in the 2011 baseline rate. However, the differences do suggest that persons interested in how to reduce reoffending rates should visit the North West to understand if they are doing anything different there. Source: Interim proven reoffending statistics for the Community Rehabilitation Companies and National Probation Service supporting tables January 2017.
http://getthedata.co.uk/wp-content/uploads/2017/02/Crime-Doesnt-Pay-374x263.jpg 263 374 Jack Cattell http://getthedata.co.uk/wp-content/uploads/2016/08/gtd-logo.png Jack Cattell2017-02-07 10:56:052017-03-01 13:20:57CRC Reoffending Rates: Who’s Striving, Who’s Struggling? Brexit and the new Trump administration have added “post-truth politics”, “fake news” and “alternative facts” to our political lexicon. Just words? Well, “words matter”, as the former president reminded us when he launched his own candidacy eight years ago. And these new words matter very much when accompanied with calls to dismiss experts in favour of gut feeling and instinct. Democracy needs to be informed so hearing a senior member of the British Cabinet claim that “people in this country have had enough of experts” was one of the most lamentable claims of the Brexit campaign. All of this is surely at odds with a community of policy researchers and evaluators whose stock in trade is objectivity, fact-finding and balance. So where do we go from here? Government needs diversity of evidence to answer policy questions, and this evidence needs to be timely. To maintain credibility, there is value in keeping some distance between evidence production and government. Independence gives extra authority to evaluation or analysis of policy. Good communication is vital. It’s not easy to pare down a large body of evidence, and technocrats may need to be trained on how to write concise policy briefings. Political leaders and members of the public need to be encouraged to use and demand evidence. Persuading politicians and those controlling the money is not enough. In democracies, we also need to persuade the public to care about evidence. This was a truly global initiative and there were some notable examples of good practice that we in the West can learn from developing countries. A copy of the report can be found here. At its best evaluation serves as Socrates’s “gadfly”, challenging assumptions and questioning implicit principles. Public servants – policy makers and evaluators – need to stand their ground, be reasonable and communicate evidence effectively. 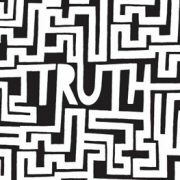 If we are indeed entering an era of “post-truth” politics then we need more than ever “to speak truth to power”.